It would have been a great feature but I am left with no choice but to switch to a different service. Don’t get me wrong, IFTTT is a great service and it has opened a lot of possibilities to the world! However I am quite disappointed when I have tried one of their triggers. I have searched for solutions or possible alternatives on what I want to do. The one I wanted done is simple, I like a photo in instagram.com and it gets automatically saved in my dropbox folder. It’s a nifty feature actually when I found out that there was a trigger for it. However, there was nothing said about a limit and I had to experiment on it just to make sure my assumptions were correct. 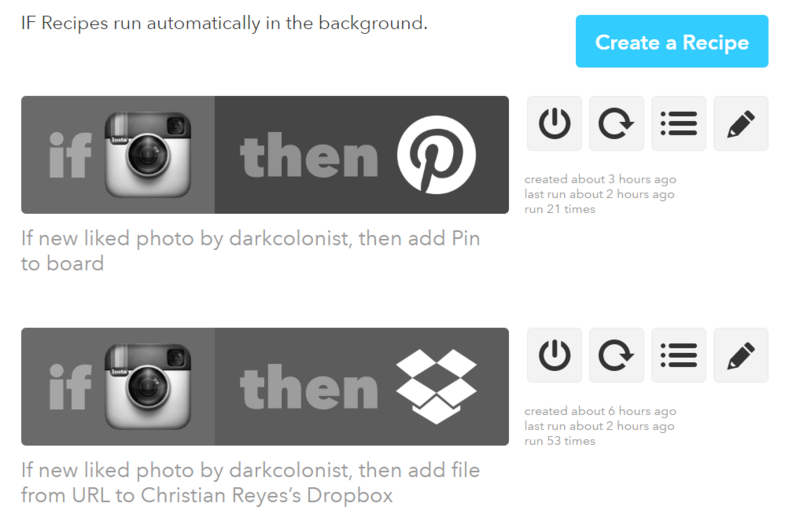 It cannot be found anywhere that the Instagram Like trigger in IFTTT.com has a limitation of 20-likes per hour. Basically, it saves your last 20-liked photos in your dropbox account. To me, all I wanted to do was have a zoom-able view of the pictures I liked since Instagram doesn’t allow to do so unless of course you turn on accessibility options of your device but that’s not the case. So what if I liked more than 20 pictures? well, those get omitted naturally but the app doesn’t tell you, IFTTT doesn’t tell you! You’ll just be wondering soon why a lot of the liked pictures just don’t appear in your dropbox account! 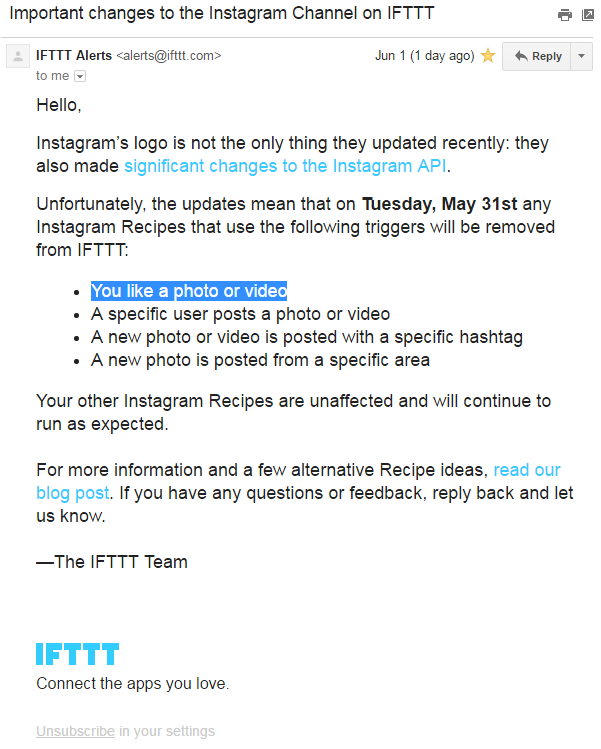 Just a day ago, I received an email from IFTTT. They announced that they’re no longer supporting the feature mentioned earlier in this post. This entry was posted in Techy Thoughts and tagged ifttt, internet. Bookmark the permalink.